We are beginning to feel that Beaujolais Villages is overpriced in Germany. DeM4.99 seems to be the standard price point for this class of wine but we have yet to encounter a bottle that is better than the Chianti that the same shops usually sell for a Mark less. 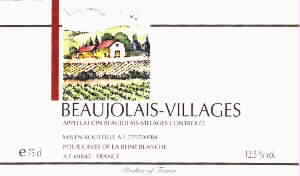 This bottle was easily better than the other 1999 Beaujolais Villages that we have tried but it still doesn't make it in comparison to other types in this price bracket. Pay the same money for a Cotes du Rhone Villages and you will get a similar wine but with a fresher more fruity taste. This wine suffers by having not enough acidity to wake it up and you should move on to another choice. DeM4.99 from Penny Markt throughout Germany.